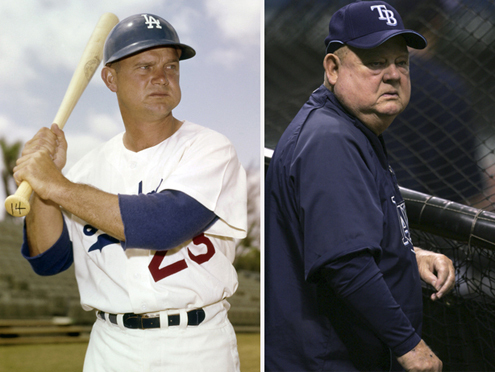 Renegade Note: Everyone has their own Don Zimmer moments within or outside the game. The following is my first encounter with the beloved baseball soul who held the game close to his heart and embraced it until the end. We will miss you Zim. I was around 11 years old when I first met Don Zimmer. It was late January of ’72 when I met Zimmer and his wife Soot when they were out and about for an afternoon cruising around the town from their then home situated on the finger islands of Treasure Island. I didn’t know the first time he drove into the station he was even a ballplayer. People in that era either dressed up or wore subdued cotton shirts and pants and they both blended in nicely to the fashions of the time period. M L B branded and mass merchandised clothing was usually reserved for the diamond and almost never plastered across your body as every day clothes. Style and class was all the rage back then. I always idolized my Dad and worked a lot of after school and most weekends at our Union 76/ Pure Oil gas station (Wittig’s Motor Pool) on the popular crossroads of Pasadena and Central Avenues which were main thoroughfares into and from the beaches here in West St. Petersburg, Fl. Back then every one of our gas station’s 6 pumps demanded that special Full Service attention. That meant as a young kid I would wash windshields, check air pressure in tires, check the oil levels and put the regular or premium gasoline nozzle into the car’s tank and popped in as much gas as the customer needed. I loved doing my duties in a scaled down shirt emblazoned with St. Pete AAA patches, the orange Union 76 globe patch on one sleeve and the name “Cliff” sewn in above my breast pocket. Back then people asked me if this was my station, and I said “Yes”, hoping one day my Father, who was also named Cliff would throw me the tow truck and door keys for good. As I was under the hood checking the brake fluid, wiping down the oil dipstick and checking for corrosion buildup on the battery cables. I noticed Zimmer’s eyes peering at me through the small space between the hood and the windshield section of the car. He was laughing and seemed to get a kick out of this young kid going gangbusters servicing his beautiful automobile. He even chuckled when I told him one of his belts was a bit worn and he might want to keep an eye on it. After I heard the click of the gas nozzle and finished filling the car’s gas tank. I then approached and told Zimmer the amount and awaited the payment for the gas. He asked me if we, (the station) ever got large used tire tubes he could use as an inexpensive but fun float for when his family headed out to the Gulf of Mexico. I assured him I could help him for honest price. I saw that most of them were not very large in size and remembered I had a huge truck tube outside by the alignment rack I used as a baseball aid to help me hone in my budding curve ball. Zimmer watched as I went through the moves of making sure the tube was filled, had no leaks then pronounced without hesitation, “I can sell this fine tube to you for .75 cents”. Now do not forget, a gallon of regular gas at that time cost between 39-45 cents by itself, so for the price of about 2 gallons of fine Union 76 fuel, he could have hours of unadulterated enjoyment stretched out on that huge truck tube getting roasted by the warm Florida Sun. I finished the exchange and Zimmer presented the money to my Dad for the gas and the tube and Zimmer asked why there were white lines on the inside circle of the tube. My Dad explained it was my “throwing tube” to practice my aim and accuracy as I played Third Base and sometimes pitched for my Little League team. Zimmer just looked at me and asked if I was good. He looked at my Dad then me and I told him I wanted to be the next Brooks Robinson and Zimmer smiled telling me that “Brooks was a great ballplayer to watch and copy parts of his defensive style and stance”. As we opened the trunk to put in the tube I saw a few gloves, a stack of bats and a bag of worn and clay stained baseballs. Zimmer quickly said he also loved the game of baseball and worked out with his young son when he had the time. At no time did he pump out his chest or proclaim he was an ex-MLB player or even a World class Coach and Manager. At that moment he seemed to me to be just an average guy who also loved baseball and was passing on that unique love for the game to his own son. After Zimmer had left the station headed back west towards his Treasure Island home, my Dad told me who he was, and that he was not only a former M L B player who had played for teams in cities like Brooklyn, Chicago, New York and even the Washington Senators. I was upset I had wasted an opportunity to chat or get a few pointers from a big league infielder, but knew he was also a loyal customer and would be back. He even came in for fuel before he headed off to San Diego that spring to begin his Managerial career with the San Diego Padres. He even asked how the curve ball was coming along. I didn’t have the heart to tell him I was mostly playing Third Base that new season, but if needed I did pitch, but no curve balls. I always felt at ease talking and being around Zimmer, never got the “better than me” vibe or saw any irritation from him when I asked questions or wanted advice. That is what initially got me to follow his career and take every moment possible to talk with him. When I became the Rays Pepsi rep and had a little extra access around Tropicana Field or the Rays Spring complex I would see Zimmer a lot, and always made sure to say “Hello”, shake his hand and if he wanted to tell me or someone else nearby a tale…..I was all ears. Every time I have met Zimmer since that day in 1972 I start off with asking him if he wanted “Regular or Premium today”. It always takes a moment, but he always chuckles and asked how I was doing while extending his hand for a firm shake. I will miss Zimmer as much for his humanity as his storytelling and bits of wisdom bestowed upon so many great generations of ball players. There has never been anyone like him around the game of baseball before, and there truly will not be another beloved soul like Zim to ever grace the game again. If you asked me what I thought of Don Zimmer, the answer might sound like I was still possibly pumping gas into his car. He was a premium man who acted more regular than anyone I have ever met. God Bless you Don, I’m an truly going to miss seeing and hearing your grand stories.